FIA Sports Management is pleased to announce that Pablo Sánchez has extended his contract with Adelaide United for another season. The extension will see the Spaniard remain with the Reds until the end of the 2015/16 season at the least. So far in his time with the Reds, Pablo Sánchez has made a total of 27 competitive appearances – four in the inaugural Westifled FFA Cup and 23 in the Hyundai A-League, the latter of which seeing him score seven times. Pablo Sánchez joined the club in August 2014 from Spanish Segunda División club, Club Deportivo Lugo, and has enjoyed an excellent first season as an Adelaide United player. After putting pen to paper on his new contract, Pablo Sánchez said that his mission since first wearing the United shirt was to always earn a contract extension, explaining his time in Adelaide has exceeded all of his initial expectations. “I am so happy to re-sign and it was my objective since the first day that I wore the Reds shirt,” Pablo Sánchez said. “I have played a good season and the club wanted to re-sign me. I have also been part of the good football that we are playing and I am happy for this. “I have enjoyed everything about my first season here. We won the Westfield FFA Cup and we have stayed in the top half of the table the whole season. “My teammates are amazing both professionally and personally and so is everyone in and around the club. This group is amazing and we are all friends. At the end, the group was the main reason for me to re-sign. “When I first signed I expected good things, but the feeling once I came to Adelaide is better than what I could have ever expected. Coach Josep Gombau was very pleased that Pablo Sánchez extended his contract with the Reds. “Pablo has had a very good season and we are happy to have him here with us for the next season,” said Gombau. “He is a versatile player that can play in different positions and can score goals as well. He is also a very respected team mate and adds a lot of value to the playing group. 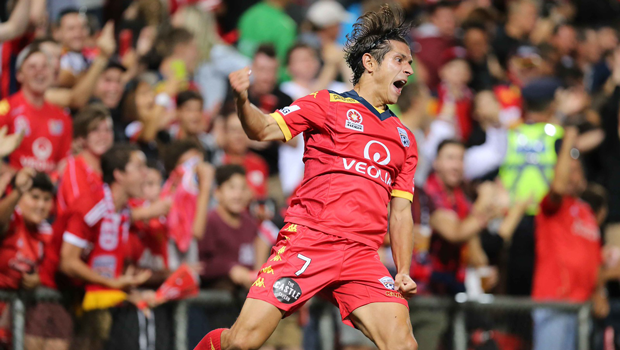 © 2015 Adelaide United FC | This article first appeared on adelaideunited.com.au.